This map of the island of Bermuda appeared in the 1633 edition of Gerhard Mercator/Jodocus Hondius' celebrated world atlas. 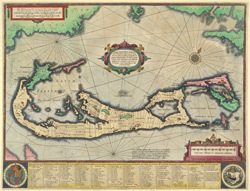 The map, based on Speed's map of 1626, features the title in a decorative cartouche in the centre and scale bars showing various distance measurements at top left and bottom right. The map shows the island divided into 'Shares,' designating the properties given to the 'Adventurers' who were shipwrecked there in 1609. Below the title, a miniature map shows the relative position of the island in association to the American mainland. This "little island that isn't there" was thought by many later cartographers to be real, and appears on several maps during the following 150 years. In 1612, the Bermudas were granted to an offshoot of the Virginia Company. This explains the note on the Roanoke colony in Virginia in the title and the Virginia Company's coat of arms at bottom left.